GYST Radio is a resource for all information on the business of art, hybrid careers and other DIY strategies for a successful career in the arts. We believe that artists should define their own careers on their own terms, and we provide the necessary tools and resources for doing so. We have great resources for artists but this radio broadcast concentrates on DIY artists, independent curators and arts organizations that support artists. Instead of waiting to be validated by a "gate keeper" come and find out strategies for doing it yourself here. We also post relevant content from other providers, so enjoy. GYST DO IT! is hosted by independent curator Kara Tomé. ARK Arts inhabits a multi-use building with an art gallery, four artists' studios and a concert/performance space, located in Altadena, CA. Artist Kira Vollman and her husband Robert Deblasis purchased and renovated the building and began programming events in spring of 2015. Artists Blake Whitaker and Zachary Taylor took over an empty storefront to create an exhibition space as an art project, which they called The Los Feliz Museum of Contemporary Art. The artists grabbed the opportunity to temporarily utilize a space in a prime location in the Los Feliz area of Los Angeles, next door to a popular neighborhood bar. Employing the tropes of institutional language for the project's web site, they named themselves “artists-in-residence” and curated a show of their art work. Promoting on social media, they hosted an opening, with live music and a performance. The artists discuss their thought process in creating the pop-up show, the excitement and challenges of being artists in Los Angeles, and the opportunities for those who create DIY art shows. GYST DO IT! was created by independent curator Kara Tomé for GYST Radio. GYST-Ink is an artist-run company providing information and technology solutions created by artists for artists. GYST is dedicated to empowering and educating artists so that they can develop sustainable and successful careers on their own terms. Founded by artist/curator Bernard Leibov in 2009, BoxoPROJECTS is a multi-program arts initiative based in Joshua Tree, California, dedicated to exploring contemporary art at the new frontier. GYST DO IT! With Curate L.A. Guest is Alexandra Shabtai, founder of SPArt, a new funding initiative that supports Los Angeles-based Social Practice Art projects. SPArt provides financial resources to artists who intend to create social change through socially engaged art. Hosted by Kara Tomé, GYST Radio Manager and Independent Curator. GYST DO IT! promotes artists and creatives who take the initiative to present innovative arts programming for the public through starting a collaborative, an independent space or a non-profit organization. TRACTIONARTS is a video venue in the heart of the Arts District in downtown Los Angeles. Videos are rear projected in the street-facing window of artist Ken Marchionno’s studio for the public to view in the evening hours. He started curating this very alternative space in 2013 to expose the community to new and interesting video art. Corrie Siegel, Network Map, In Progress (detail), ink on paper. Star Tours, Los Angeles-wide. 17 x 21″. Guests are Addy Renteria and Erin Stone, founders of the 11:11 Collective, whose mission is to make the San Fernando Valley in California become a strong and independent artistic community and a flourishing destination for innovative art. Since 2009 the collective's exhibitions and events have seen tremendous growth and they are in the process of becoming a non-profit organization to facilitate even greater success. The Fill in the Blank project is their new catalyst for supporting artists in the creation of major murals throughout the valley, with community support. What's on Los Angeles is an exhibition listing App designed for viewing on mobile devices. Created and maintained by artists Jody Zellen and Brian C. Moss as a useful tool and service for the Los Angeles arts community. Host Kara Tomé will talk with Jody and Brian about how the idea to create this App came about, the challenges and potential rewards of creating a marketable service, and their plans for developing it further. Guest: Sharsten Plenge, of We Open Art Houses (WOAH) a Los Angeles-based creative agency and idea hub transforming open spaces through ephemeral visionary projects since 2012. WOAH envisions underutilized and off-the-grid spaces as opportunity for experimentation. A not-for-profit initiative and sponsored project of Fractured Atlas, WOAH works in tandem with artists, multimedia brands, and property owners to orient pedestrian activity and create experiential environments in unexpected places. Interviewed on the show is Aurora Tang from High Desert Test Sites, discussing the history of the organization and the recent receipt of non-profit status after a decade of programming. Artists/collaborators Gabriela Salazar and Mary Choueiter will discuss their on-going curatorial project CAROUSEL. CAROUSEL is an exhibition experiment. It is a venue on a turntable. It is a nomad. It is an anachronism. Surpassing its time and usefulness, CAROUSEL is cheap, familiar, a little stubborn, and begging reinterpretation. Regular one-night-only ”openings” showcase an artist and their use of a mechanical slide projector. Collaborating artists Wendy DesChene and Jeff Schmuki created PlantBot Genetics, a parody company that satirically looks at the possible evolution of plant species due to the consequences of modern agricultural practices, including GMO’s. 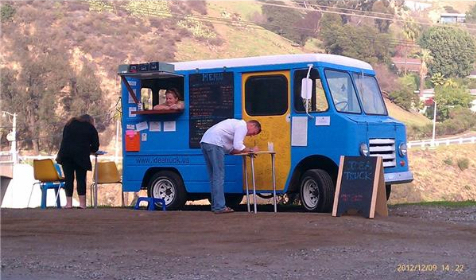 The artists create public interventions featuring their hybrid, robotic plants, including ‘Monsantra,” through the PlantBot Art Lab, an eighteen-foot trailer they converted into an off-grid, mobile exhibition space and classroom; the Greenhouse Field Lab, a solar powered portable green house ‘laboratory” for site-specific education and experimentation; and gallery and museum shows. 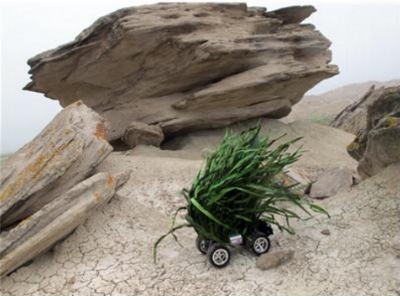 PlantBot has been displayed around the U.S. and the world, including in Egypt and Austria. The artists have been in residence at the McColl Center in North Carolina and the Hafnarborg Art Center in Iceland, and will create projects at the Landscape Laboratory at Buitenwerkplaats, Amsterdam and the KulttuuriKauppila Art Center in Finland. The Industry presents new and experimental productions that merge music, visual arts, and performance in order to expand the traditional definition of opera and create a new paradigm for interdisciplinary collaboration. The Industry aspires to be regarded on a national level for premiering the most exciting and experimental new work in the country. Guests will be members of the artist collective Concord, a trans-disciplinary collective, artist-run gallery, international residency program, and a home in Cypress Park, Los Angeles. Concord's two main interests have been collectivity and usership. Collectivity both as a process and an object of inquiry and usership through shows and events that engage audiences to explore, discuss, and interact rather than witness or view. As both an art project and a project space, Concord practices and provides a platform for critical models of art-making, culture-working, and community building. John Hogan, performance still of "First Choice" from the opening of Dialogues of Practice, Part 1 , March 14th, 2013.